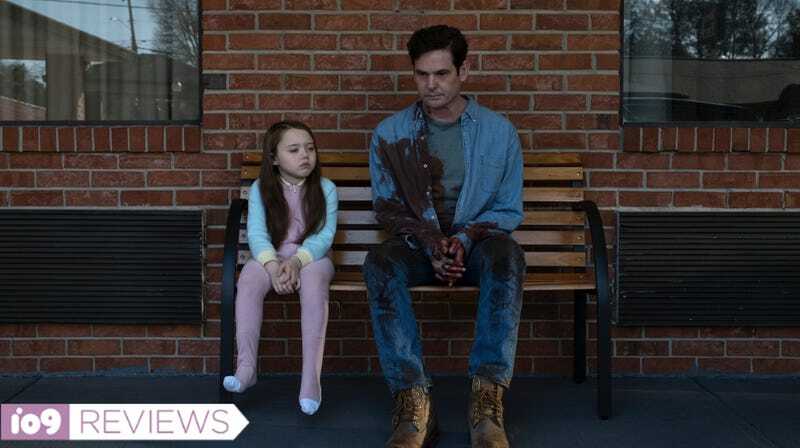 Nell (Violet McGraw) and her dad (Henry Thomas) leave Hill House, but it never really leaves them. Netflix’s new horror series The Haunting of Hill House is indeed about a haunted house—but it’s really more about a haunted family, all of whom are traumatized by the summer they spent within the title dwelling’s walls. This is not your typical Halloween fare, but it is still very chilling. We’ve seen all 10 episodes of The Haunting of Hill House, created by horror auteur Mike Flanagan and loosely based on Shirley Jackson’s classic novel, but we won’t be spoiling any big plot points in this review. The series swirls around a tragic mystery in the past that slowly takes shape over the season; it drives the frequent chapter-ending cliffhangers (once Hill House hooks you in, you’ll be binging for hours) and one of the show’s most satisfying pleasures is watching all the pieces come together. Hill House is divided into two time periods—the early 1990s, when most of its protagonists were children, and the present day, when all of its protagonists are very fucked-up adults. You do not need to have read the Jackson book or have seen any previous adaptations to watch this new version, which uses the original story as more of a loose jumping-off point. However, there are some references sprinkled throughout for O.G. fans, including character names and some familiar imagery. Olivia Crain (Carla Gugino): architect, matriarch, and provider of great hair genes. Episode one introduces us to everyone and everything, including the house that was “born bad” (as Jackson famously wrote) and the dreadful events that finally made the Crain family flee the place in the dead of night. Part of the story’s modern twist—and, frankly, one of the least-believable things about it, in a tale filled with ghouls and mindfuckery—is that Hugh and Olivia Crain (Henry Thomas and Carla Gugino; Timothy Hutton plays the older version of Hugh) are house flippers who see Hill House, a magnificent Gothic mansion that’s rumored to be the most haunted house in America, as their ticket to easy living. If they can just renovate the house, which they plan to do in a matter of months, and sell it at a high price, they can build their own dream house and stop moving their kids around from project to project. The cavernous Hill House actually looks in decent shape for having been empty for years, but the Crains soon get a hard lesson that anyone who’s watched any amount of HGTV or tried to fix up their own home could already guess, which is that no renovation is ever simple. And as you can imagine, the supernatural element only makes things worse. The five Crain kids—Steven (Paxton Singleton, played as an adult by Game of Thrones’ Michiel Huisman); Shirley (Lulu Wilson, played as an adult by Twilight’s Elizabeth Reaser); Theodora (Mckenna Grace, played as an adult by Kate Siegel); and twins Nelly (Violet McGraw, played as an adult by Victoria Pedretti) and Luke (Julian Hilliard, played as an adult by Oliver Jackson-Cohen)—almost immediately sense the ghosts, which are none too shy about making their presence felt. However, a recurring frustration in both of the show’s time periods is that certain Crains remain stubbornly skeptical about the existence of ghosts. Sure, they know something very weird is happening, but they prefer to see mental illness, extreme stress, or substance abuse as the cause. There’s a lot of dialogue that circles “Why don’t you believe me?” around and around, and that can get tiresome—especially when the ghosts seem so real to us. In addition to being visually terrifying, these spirits are cruel and insidious; they appear on dark and stormy nights, but they also pop out when you aren’t expecting them, and they do monstrously awful things. Shirley and Steven, looking grim as usual. Whether or not the ghosts they see are “real” or imagined, two things are absolutely certain: the Crains are all traumatized and overloaded with fear, guilt, and regret—and it all traces back to Hill House. None of the adult Crain kids are living happy lives. Steven is an author whose failing career turned around when he wrote a book exploiting his family’s time at Hill House, which of course made him a pariah among his siblings. Uptight, icy Shirley runs a funeral home. Theo is a child psychologist who uses her psychic abilities—she can learn someone’s secrets by touching them—to assist her troubled young patients, but she’s otherwise completely emotionally closed off. Luke is a drug addict whose repeated failures to get clean have exhausted everyone’s goodwill. And needy Nelly struggles with depression that’s gotten worse since a recent personal tragedy. Of course, the real main character of the show is the house itself, which can’t really “speak” in the traditional sense but conveys volumes through its mise-en-scène and its spectral inhabitants. (If it could make any sound, it would probably be an unyielding shriek of pain.) We do learn a bit about the family who built the house, but the show is way more concerned with the Crains and how they become part of the house’s gruesome legacy. Hill House’s production design is stunning, creepy, and clever—the house has a kind of Overlook Hotel thing going on, where it’s enormous but also confining. (As it happens, Flanagan is also directing the Shining sequel, Doctor Sleep.) It also has the Overlook’s ability to tamper with the minds of all who cross its threshold. The lights are on, but you’re not home. And that includes you, Netflix viewer, foolishly thinking you’re safe at home watching this all unfold from your couch. Word to the wise: nothing that you see on this show, which is stuffed with unreliable narrators, should be trusted or taken at face value. As the season progresses, Hill House revisits scenes that we’ve already witnessed from one character’s perspective, turning the meaning we’ve already attached to the moment inside out and reminding us that anything we think we’re seeing could be an illusion. Because these reveals are so hard-earned, with so many plot intricacies and so much emotion carefully built up around them, they don’t feel cheap or gimmicky. Just when you think you have the story figured out, Hill House starts slowly peeling back its layers, and then it does it all over again. I will say that Hill House gets a little touchy-feely toward the end, with a final episode that runs longer than any other as it scrambles to tie up the many dangling threads still swaying over the climax. There are a lot of characters to attend to, both living and deceased, and everybody has to get their conclusion. But thankfully, the show also never forgets that you’re there to be scared first and foremost. And on that front, at least, it totally delivers.